Some of the links in this post may be from our sponsors. Policy Page There are tons of easy ways to get paid to take pictures without being a professional photographer. With better cameras on smartphones and the increasing affordability of high-quality digital cameras, many people have taken up photography as a hobby. What most don’t realize is that this hobby can make you some easy cash. In this article, we’ll look at how to make money with photography (even if you only have a smartphone) and show you the best websites to sell photos online. You don’t have to be a professional photographer to make money from your pictures. In fact, all you need is a smartphone or a digital camera and a decent eye. There are tons of websites and apps that allow you to sell your pictures. You can sell your pictures as art, or you can upload them to be used as stock photos. Either way, you’re making money! If you’re interested in getting paid for your pictures, but don’t want to spend too much time and effort on the process, check out some of these apps that pay you to take photos. You don’t need any photography expertise—though a good eye helps—and they’re one of the quickest and easiest ways to make money with your images. When you think of ways to get paid to take pictures, Ibotta probably isn’t the first option that comes to mind. However, that’s exactly what Ibotta does. 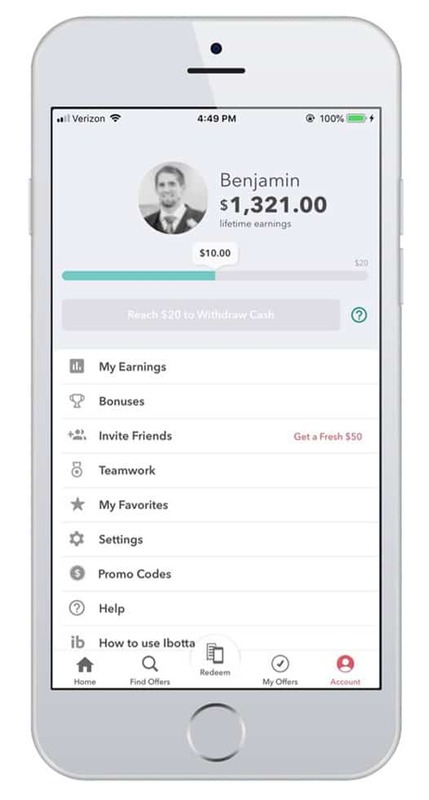 If you aren’t familiar, Ibotta is a cash back app mainly geared towards grocery shopping. When you create an ibotta account, you get immediate access to deals and coupons at participating stores. Select the deals you want, then redeem them by snapping a picture of your receipt to receive cash back on everyday items. You can also link your store loyalty cards. Then all you have to do is select deals before you shop and your cash is automatically added to your account. It doesn’t get much easier than that! EyeEm is like Shutterstock or Adobe Stock, but it’s geared towards those who want a quick and easy way to get their photos online and sell them. With EyeEm, pretty much all you have to do is download the app. The EyeEm app can go through your camera roll and automatically select the highest-quality photos. Of course, you have the final say on what you choose to sell online. While EyeEm is convenient, you don’t get to keep as much of the profits. You’ll only pocket 50% of what your photos make. Foap is another easy app that allows you to sell pictures from your phone straight to big companies. Like EyeEm, it’s easy to use and you keep half the money when your pictures are sold. One thing that sets Foap apart from EyeEm is their Missions feature. Foap features Missions that tell you what a company is looking for so you can submit photos for consideration. If your image is chosen, you get a bigger payout. Snapwire works a bit differently than other stock photography websites. On Snapwire, you make money with your photos by responding to creative Challenges. Read the brief and submit your photos. If your pictures are chosen, you get paid. When Buyers nominate your photos, you level up for the opportunity to compete in live Buyer Requests and other commissioned assignments. Snapwire contributors keep up to 70% of the payout on successful Requests and Challenges. miPic is one of the easiest ways to sell photos for money. All you have to do is take pictures and upload them to your gallery from your phone or computer. The miPic team handles everything else. They’ll check the resolution on your photos and only show the products that would print well. They also handle promotion, printing, shipping, and customer service when your photos sell. However, the convenience of miPic also comes with a pay cut. miPic artists earn up to 20% commission for their work. That may be lower than other sites on this list, but it’s still not bad for a fairly passive way to make money. Also, keep in mind that miPic isn’t just selling your photos; they’re selling your pictures printed on merchandise. Rather than a 70% commission on a $10 photo ($7), you might get 20% for a $50 wallpaper print ($10). If taking professional photos or competing with other talented creatives doesn’t sound like your speed, then this one’s for you. Here’s how you can get paid to take pictures of yourself with as little effort as possible. This app is like a selfie scavenger hunt. Select a selfie survey, read the instructions, snap a selfie, and get paid! That’s quite literally all there is to it. Pay Your Selfie rewards survey takers anywhere from $0.20 to $1 for completing surveys as per the instructions. Once you bank $20, you can cash out and start all over. It may sound silly that you can get paid to take selfies, but the idea behind it is actually genius. Pay Your Selfie and similar apps are visual market research companies. Rather than having you answer survey questions about your lifestyle and shopping experiences, they ask you to report it visually by snapping a selfie. They sell this information to brands, which then use it to improve their products and services. One of the easiest ways to get paid to take pictures is through stock photo sites. Stock photo sites have all kinds of pictures. Companies or individuals who need a particular image search stock photo sites, and when they select a picture to use, they pay a small fee. If they pick your photo, you’ll get a cut of the fee they pay. Most stock photo sites don’t hire professional photographers to take their pictures. In fact, anyone can upload their photos to a stock photo site and get paid for them. What Kinds of Photos Make Good Stock Photos? Not every picture is ideal for use as a stock photo. Stock photos are used by companies in presentations, ads, websites, brochures, and more. If you’re serious about making money selling stock photos, you need to take the right kinds of pictures. First, make sure your pictures are free of any brand names or logos, which will make them unusable. Stock photos should be fairly generic. Remember, you want a photo that any company could use. Next, think about the focus of your picture. When companies look for stock images, they’re typically looking for a picture of something specific—a person at work, a particular kind of food, or a nature scene. Pictures with too much clutter don’t make good stock photos. Finally, make sure your photos are high-quality, bright, and focused. Dull or out-of-focus images won’t sell well. To get inspiration, look through some stock photos before you start snapping. This should give you an idea of what works and what doesn’t. There are tons of websites for stock photos. 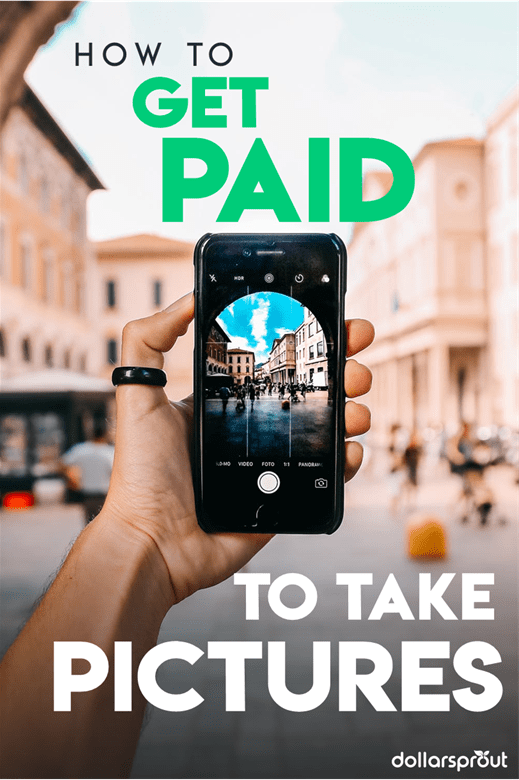 But if you really want to get paid to take pictures, you want to choose sites with a large audience that make it easy to upload and sell photos. Here are some great places to get started. Shutterstock is a great place to sell photos for money, and it’s one of the best websites to start no matter what your experience level. That’s because Shutterstock is extremely popular, so every picture you upload has the potential to be seen and purchased by thousands of people. In fact, most of the photos you see on DollarSprout.com were purchased from Shutterstock. Another great feature of Shutterstock is their easy-to-use app. You can download the app on any smartphone, and you’ll be able to take a picture and upload it straight onto Shutterstock. The app also has cool features that show you helpful tips, like what kinds of images customers are searching for. Shutterstock pays out based on the type of customer downloading your image. You’ll get paid less if a customer with a monthly subscription downloads your photo and more for customers who pay directly for your image. As your lifetime earnings increase, the amount you get paid per photo increases, too. Adobe Stock is another one of the best websites to sell photos online. With this popular site, your pictures can get lots of exposure and downloads, and you don’t have to be a professional photographer. In 2014, Adobe Stock purchased another big stock photo site, Fotolia, so anything you upload to Adobe Stock will be seen there, too. That means double exposure for you. Adobe Stock pays photographers 33% of the price of their photos. This flat rate means you might make more at first than you would with Shutterstock, but there’s less room for growth if you stick with it.  Unlike some of the other stock photography websites on this list that accept a variety of themed photos, Snapped4U only wants your event photos (weddings, concerts, event portraits, etc.). People typically visit Snapped4U to purchase pictures taken of them. If you live in a highly toured area, then you could offer to take pictures of travelers and let them know where to find their photos online. All you have to do is upload your pictures and set the price (up to $20 each). Snapped4U then sells the jpeg files directly to your customers. The fee is $0.50 on every photo you sell under $5, and 10% on photos $5 or more. Getty Images is one of the best websites to sell photos of the highest quality. However, you first have to apply and be accepted in order to sell your photos with this stock photography website. After you submit your application, you can expect to hear back within 30 business days. If your photos make the cut, you’ll have access to Getty Images vast customer base of over 1.5 million users. Royalty rates vary from 15% to 45%. You can earn higher rates by agreeing to sell your content exclusively with Getty Images. This program is competitive, so be sure to only upload your best photos. Stock photography isn’t the only way to sell photos for money. If your photos are more artistic than the average stock photo, you may want to sell your pictures online as art. There are tons of easy ways to upload and sell your artistic photos and start making money fast. Check out some of these sites where you can sell your work. Etsy is one of the biggest online marketplaces, and they specialize in handmade and personalized goods. Tons of people use Etsy every day to shop for artwork for their homes or businesses, so it’s a great place to sell your photos online. With Etsy, you can essentially set up your own little online shop and start selling your photography. Before you sell anything, you will have to pay a little upfront. Etsy charges a $0.20 fee for each item you list for sale. Once you sell your item, Etsy takes a 5% fee, plus a payment processing fee of 3% and $0.25. Considering the massive exposure your photos can get on Etsy, this is a small price to pay. While Etsy is convenient for beginners, Fotomoto is great if you’re more interested in creating a thriving photography business. Unlike Etsy, Fotomoto isn’t an online marketplace. It’s a service that handles orders, then prints and ships photos for you. If you want to set up your own website to sell photos, Fotomoto is great. They’ll handle the business side of everything, so all you have to do is take pictures. Your customers will be able to order your photos as prints, or on canvas, postcards, and more. Of course, to get this kind of service, you have to pay. Fotomoto offers three membership levels. With a free membership, you pay a fee of 22% per photo. The Pro and Pro Plus membership levels will cost you a flat monthly rate but allow you to put more money in your pocket with each sale. What Do You Need to Take Professional Photos? You don’t need a lot of expensive equipment to take professional photos. In fact, most of the time all you really need is a smartphone and some editing software! Today’s smartphones have cameras that rival the best digital cameras of ten years ago. If you want to get paid to take pictures without making a big investment upfront, using your smartphone is the way to go. Of course, not all smartphones are created equally. Make sure you choose a smartphone with a great camera—the Samsung Galaxy S9 Plus is widely considered the best, but iPhone users can get great pictures on their iPhone X, too. While you might be able to snap some great pictures with just a smartphone, photo editing software will take your photography game to the next level. With photo editing software, you can adjust the brightness, colors, and more on your photos. There are tons of options for great editing software, ranging from free to rather expensive. Adobe Photoshop is the most well-known photo editing software. It’s extremely powerful, with hundreds of tools and options. Using Photoshop, you can easily turn even a mediocre photograph into a work of art. The possibilities are endless, and Adobe Photoshop has far too many features to list here. But the prestige and versatility of Photoshop come with a high price tag. To get access to Photoshop, you’ll need to subscribe through Adobe’s Creative Cloud. The full app costs $20.99 a month. Adobe does offer a pared-down version for photographers at $9.99 per month, but it’s still one of the priciest photo editing programs on the market. If you want to edit your photos without paying the price for Photoshop, Pixlr is a great alternative. Pixlr can be used right from your web browser for free. That means you don’t have to download anything or pay any money upfront. Pixlr offers all the essential tools, like color correction and resizing, along with some more advanced tools like blurring. Pixlr also has a mobile app, so you can work on your photo editing on the go. If the standard version of Pixlr is a little too simple for you, try Pixlr Pro. For $5 a month, you get some additional tools that more advanced users might find helpful. Unlike Photoshop and Pixlr, there’s no monthly payment for Affinity Photo, only a one-time payment. At $19.99, Affinity Photo for iPad boasts a range of editing capabilities rare for any app, including advanced retouching tools, liquify effects, layering, 360° image editing, and more. The desktop software is a bit steeper at $49.99 but comes with even more editing features. If you want a software you only have to pay for once and get to keep forever, then Affinity Pro might be your best fit. Ready to get paid to take pictures? With a little work and a few simple, inexpensive tools, you can make some easy extra cash by selling your photos online. So if you think you have a good eye, try one (or more) of these suggestions and see how much you can get paid for your pictures. Have you ever tried to sell photos for money online? Share your experience in the comments! Previous post Should I Service My Car at the Dealer?